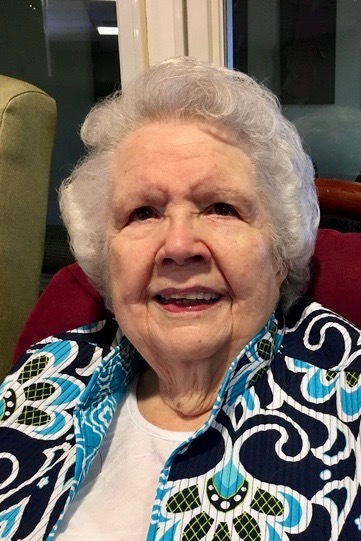 Elgarie Manning Windley, age 90 of Seaford passed away peacefully on August 23, 2018. Elgarie was born at the family home in an idyllic rural community called Farmlife near Jamesville, N.C. This is where she learned the values and faith that would carry her through a lifetime. She married Bill Windley at a young age and they spent 67 years together until his passing in 2013. She raised 3 boys and during that time she and Bill moved to Seaford, Delaware. Elgarie was a bright and multi-talented woman. As a teenager, she sang professionally performing on radio shows, at church and at local gatherings. She played the piano and accordion. She could sew like a professional seamstress, cook like a chef and run a household with a firm hand. She loved photography and arts and crafts. No one ever left the Windley’s hungry. She was at her best orchestrating big family dinners. Ham, biscuits, potato salad, deviled eggs and butter beans and corn were always favorites on the menu. She loved the beach and their house on Cape Hatteras. Her grandchildren and great grandchildren called her Nana and she never forgot their birthdays and special occasions. She spent the last 5 years as a resident at the Lofland Park Center in Seaford. The family would like to thank all those who provided such wonderful care. Elgarie will be dearly missed by her son Carlyle Windley and his wife Marcia of Seaford, DE, son Larry Windley of Dover, DE, daughter in law Tory Windley, of North East, MD; by her brother Carlyle Manning and his wife Mamie of Jamesville, NC, her grandchildren, Tom, Lynn, Tory, Tara and Michael and 8 beautiful great grandchildren. She is predeceased by her husband of 67 years, Bill Windley (2013) and son, Bill Windley, Jr. (2017). Visitation will be from 6 to 8 p.m. on Thursday August 30th at Cranston Funeral Home, 300 N. Shipley Street, Seaford Delaware, 302-629-9237. Services will be held on Friday August 31st, 1 p.m. at St. Johns United Methodist Church, at 300 N. Pine Street, Seaford DE 19973 with a reception in Fellowship Hall immediately following the burial. In lieu of flowers, donations may be sent to St. Johns United Methodist Church or the Alzheimer’s Association of the Delaware Valley at 399 Market St #102, Philadelphia, PA 19106.